Vietnam morning news by AEC News Today is your one stop source for Vietnam news on matters of governance and policies affecting Asean business communities. Việt Nam exported an estimated 1.28 million tonnes of rice in the first three months of the year, earning US$570 million. But the exports were 18 per cent lower in volume and 17.3 per cent lower in value compared to the same period last year. This was reported last week by the Ministry of Agriculture and Rural Development. Food safety is becoming a great concern for the public, according to a report released by the World Bank in Vietnam during a seminar in Hanoi on March 27. Real estate giant CapitaLand plans to ramp up its presence in Vietnam, including an investment in a possible Raffles City. English teachers can earn up to $2,200 a month – equivalent to Vietnam’s average annual income, according to a new report. South Korean government assistance has been requested for a proposed 500 MW solar PV project planned for Thac Ba Lake in Vietnam’s Yen Bai province as the local government seeks to increase its clean energy output and strengthen ties between Vietnam and South Korea. Australia issued last week a notice regarding the investigation into the dumping and the countervailing duty on aluminium extrusions exported to it from Việt Nam and Malaysia. Vientiane Governor Sinlavong Khoutphaythoune said Laos has just begun administrative reforms while Hanoi has obtained initial outcomes in this work. Vientiane wants to learn from Hanoi’s experience to build a synchronous and modern administration, thus helping to promote local socio-economic development. Vietnam’s internet speed is likely to remain slow for the foreseeable future due to further delays to repair work on the Asia America Gateway (AAG) undersea cable, while work on the country’s other internet link, the Intra Asia (IA) cable, is ongoing. Nguyen Thanh Loi, Director of the Department of Environment and Natural Resources in the central province of Quang Tri, yesterday said that VND36 billion (over $1.5 million) is allocated to improve the environment in districts affected pesticide residue. Vietnam’s shrimp exports are expected to reach between 4.5 – 5 billion USD by 2020, with an annual increase of between 9.5 – 12 percent. On March 27, Hanoi People`s Committee held a seminar on administrative reform (PAR) between Hanoi and Vientiane (Lao PDR). Daiwa House Industry announced Monday it will spend about 8 billion yen ($72.4 million) to build a large hotel in the Vietnamese city of Hai Phong with the aim of attracting Japanese business travelers. Defence Minister Gen. Ngo Xuan Lich made the remark in Hanoi on March 27 at a reception for visiting Deputy Chief of Defence Intelligence of the Royal Cambodian Armed Forces (RCAF) Lieut. Gen. Hun Manet. A court in Vietnam sentenced a prominent online whistleblower to nearly five years in prison Monday for bribery, according to his lawyer, who called the verdict “anticipated” and vowed to pursue an appeal for his client. Stream Technologies is sponsoring Vietnam’s annual IoT Startup competition, the company has announced. Organized by the Board of Management of Saigon Hi-Tech Park, the competition’s goals are to attract the interest of the startup community and foster the development of IoT-based products, and to incubate and establish new IoT startups. When a Google executive apologized to advertisers last week in London, the apology echoed seven time zones away in Vietnam. Vietnam is forecast to be the fastest-growing convenience market in Asia by 2021, according to new data released by international grocery research organisation IGD, followed by the Philippines and Indonesia. It is normal for commercial banks to adjust their interest rates in accordance with their business strategies and market situation, said the State Bank of Vietnam. The Animal Health Department under Vietnam’s Ministry of Agriculture and Rural Development has said that the country has never imported meat from any of the 21 meat processing companies being investigated for alleged bribery in Brazil. 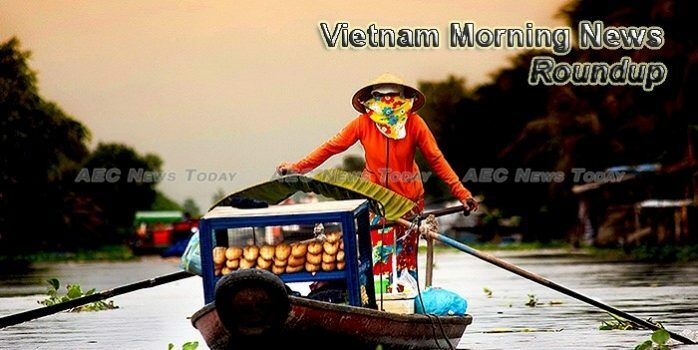 Vietnam morning news is published M-F by AEC News Today: Governance, not government; policies not politics.